So, there shouldn't be one anywhere else. If you're looking for public documents from the Thurston County Clerk (or from practically any other county clerk in Washington State) you need to pay exorbitant fees. Like almost $30 for downloading a 16 page document from a public database. But, not in Whatcom County. 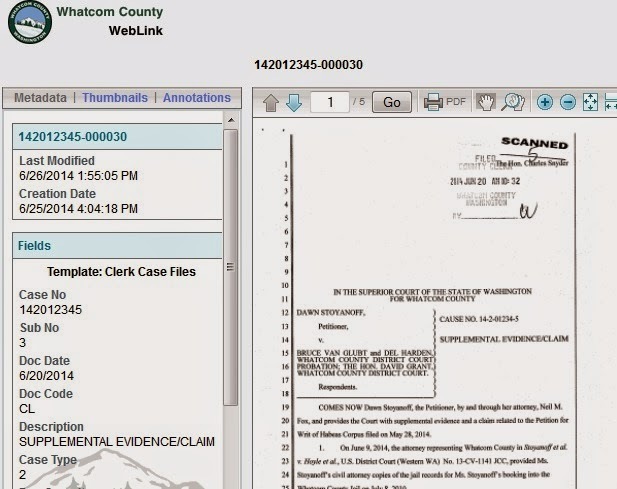 The Whatcom County superior court maintains a public database that offers direct access to court filings with no charge. As it should be. Here is a link to the Whatcom County Superior Court database. Before searching for court documents, you need a case number, which you can search by individual name or business name here. Once you plug in a case number you're interested in, you are given direct access to the entire court record. What in most counties is an unnecessarily arduous and expensive process, is simple and free in Whatcom County. This system was in place before my time, but I fully support it. We feel it saves on both staff time and foot traffic into the court house to obtain documents. We wouldn't charge for someone to come into the office to look at a file. If they chose to make copies, there would be a cost and staff time. I believe it actually saves money by freeing up staff time to do more important tasks. We have had significant reductions in force over the past several years. Further, it provides equal access regardless of financial resources. Providing for free what should already be free not only makes it easier on the clerk but provides equal access. That sounds great. This county shows that we don't really need to charge $4 transaction fees plus $.25 per page for public documents. Even though state law allows clerks to collect expensive fees for public documents (much more than what you'd pay for a document from any other part of government), Whatcom County doesn't. An interesting wrinkle is that what also makes Whatcom County different is that it doesn't have an elected clerk watching over court records. Whatcom County rewrote its county charter in the late 1970s and rolled the function of the clerks office into the superior court. I might be reading into that fact a bit too much, but having to support an entire other office aside from just the courts probably justifies keeping open as many revenue streams as possible. I emailed both candidates for Thurston County Clerk about what they thought of the public records paywall, neither of whom have written back yet. What Whatcom County shows is that there is really no reason (other than just bringing more money into a specific county office) to charge so much for public records. We are a nation of laws. Our law is created not only via legislation, but also through the adjudicative process of the courts. Whereas we generally have open and free access to the statutes that bind us, case law has had a more mixed history. Earlier experiments in secret proceedings did not go well. Western law subsequently developed strong precedents for access to judicial proceedings — citing the importance of transparency in promoting court legitimacy, accountability, fairness, and democratic due process. When the law is accessible, “ignorance of the law is no excuse." The public interest is not served when only those who can afford it can have access to what goes on in our courts. Nicely done. It's ridiculous that the state Open Records law limit on what can be charged for public documents doesn't apply to the courts. A law unto themselves? But, why did the Indian Shirt Story change?